During 16-17 July in Guiyang China, an important conference, Eco Forum Global, was held with the title of walk to the green revolution of ecological civilization—opportunities and challenges. 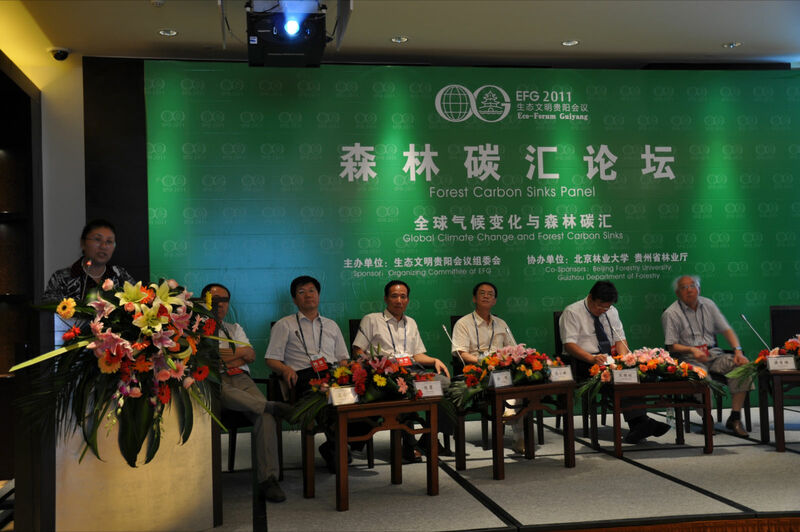 Dr.Li Nuyun, the Secretary General of China Green Carbon Foundation attended the conference to state the Policies and practices of China’s forestry for address climate change, gave a speech on forest carbon forum about the forestry carbon and carbon trade. Dr. Li introduced the forest unique function for climate change mitigation and adaptation, which including the relation of forest carbon sequestration function and forestry for address climate change, the forestry carbon management policies in China, how the CGCF facilitate enterprises to low carbon development and the conditions and trend of carbon trade. Representatives actively raise questions on how to accelerate the forestry carbon development so as to fulfill the object of afforestation 40 millions and forest biomass stock 1.3 billion m3, how to push ahead the enterprises’ voluntary emission reduction. It was considered to be a good opportunities to learn and communicate on the field of forestry carbon with this brief, scientific, credible report. Meanwhile, it helps to deepen understanding of the new status, tast and measures of forestry for addressing climate change. During the conference, many press including Guiyang Daily, Guiyang Radio Broadcaster etc interviewed Dr.Li to share these knowledge to the public through various way. Eco Forum Global contributes to establishing a platform for government, industry, institutes, press and public to communicate and share with each other. Presently, the forum has become a important bridged for different industry, department and countries and a window to show the ecological construction performance. 2011 Eco Forum Global was co-hosted by CPPCC, MOST, MOEP Peking University, NDRC etc. There were totally more than 600 representatives coming from Gov, International NGOs, Corporations, University.